Heartburn is a type of indigestion where acid from the stomach rises up your gullet (oesophagus), the tube that carries food from your throat to your stomach. Overeating is a common cause of heartburn, as are alcohol, smoking and rich or spicy foods. Stress, worry and rushed meals can all make heartburn worse by increasing the production of stomach acid. Other triggers for heartburn are lying down after eating and pressure on the stomach from being overweight or pregnant, wearing tight clothes or bending over. Like indigestion, recurrent heartburn may in some cases point to a stomach ulcer. Ulcers can develop if too much acid or an infection with the Helicobacter pylori bug damage the stomach wall. Some medicines, such as aspirin, can hurt your stomach lining as well. 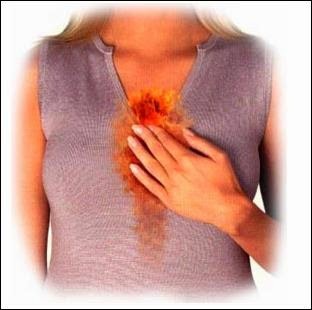 Heartburn may also be a sign of a hiatus hernia, where part of your stomach protrudes into your chest. This weakens the valve at the top of the stomach that normally prevents food and acid from escaping into the gullet. A burning feeling in your chest and upper stomach, sometimes extending to your throat, is normally a sign of heartburn. Other symptoms include a sour, acid taste at the back of your mouth and excessive wind or belching. Sometimes you may find it painful taking in certain foods and drinks. What Can I Do Immediately To Make My Heartburn Better? 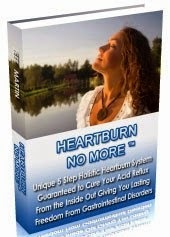 • Steer clear of large meals, spicy foods, alcohol, coffee, cigarettes and anything else that brings on your heartburn. Both coffee and smoking relax the valve that stops stomach acid from rising into your gullet. • Do not go without eating for long periods, as this increases the level of acid in your stomach. • Instead, eat small amounts at regular intervals and chew your food well. • Do not go to bed for at least an hour after eating. If your heartburn is particularly bad at night, prop yourself up with extra pillows or raise the bed-head a little. Sleeping on your left side will help your stomach to empty. • When you have eaten, try to stay upright for at least an hour and do not bend over. • Try to lose weight if that is the problem. Avoid wearing tight clothes around your stomach. • Milky drinks, particularly taken at bedtime, should help to soothe the acid in your stomach. • Think about whether stress may be contributing to your heartburn or indigestion. • Do not take painkillers - especially aspirin - or other anti-inflammatory drugs (e.g., for rheumatism) unless you absolutely have to. • Ask your pharmacist about medicines for relieving heartburn. What can I do generally to avoid getting heartburn? • Eat regularly and in moderation. Do not overdose on spicy foods, coffee, alcohol, etc. • Give up smoking or at least try to cut down. • Try not to rush your meals or to keep getting up and sitting down while you are eating. • Get to bed on time and not too soon after eating. • Keep your weight down and your stress levels manageable. What Treatments Can I Buy Without A Prescription For Heartburn Remedy? Your local pharmacist will be able to recommend a product for your particular symptoms of heartburn or indigestion. So-called rafting agents which form a protective layer or raft on top of the stomach contents are particularly suitable for heartburn. They sold as tablets liquidssometimes combined with an antacid neutralises acid. Antacids most widely used remedies indigestion. You can also buy newer treatments that cut down the amount of acid produced in your stomach. Some of these products can be taken in advance to prevent heartburn or indigestion. Make sure you follow the label directions carefully on these and other indigestion remedies. Medicines for heartburn and indigestion treatments should not be taken regularly without consulting a doctor. • If you are getting severe or persistent indigestion, particularly at night. • If your indigestion is not helped by dietary changes or non-prescription treatments. • If you have stomach pains that get worse after eating. • If you lose your appetite or your weight drops unexpectedly. • If you have problems swallowing. • You are vomiting repeatedly or vomiting blood. • You feel weak or faint. • After a bowel movement your stools look very dark or black. • Avoid spicy food, alcohol, coffee, etc. • Give up smoking or cut down. • Eat regularly and in moderation. • Do not eat too close to bedtime. • Try not to get too stressed. • Do not take aspirin or other anti-inflammatory drugs unless you have to. • Ask your pharmacist about treatments for heartburn. • See a doctor if you still have heartburn after changing your diet or taking non-prescription treatments.